Since the creation of the Belgian state in 1831, some members of the Flemish community have maintained citizenship as Flemings rather than as Belgians and have located their desire for independence from Belgium directly within the concept of a long-suffering and thus martyred history under Belgian (i.e. French-speaking) rule. This ideology is clearly articulated in two sets of stained glass windows located in the unusual and controversial IJzertoren Memorial Museum in Diskmuide, Belgium. Conceived as a memorial to the Flemish men who died at the Belgian front during the Great War, the memorial, and much of the symbolism ascribed to the site, has functioned as a physical manifestation of the idea of a distinct Flemish ethnicity as opposed to Belgian nationalism. 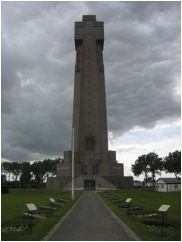 This becomes evident, for instance, in the tower’s physical structure which evokes the tombstones designed for the Flemish soldiers containing the Flemish “AVV-VVK” inscription: “All for Flanders – Flanders for Christ”, which encodes the ideology and symbolism of the Flemish Movement within the language of martyrdom and perseverance (Picture 1). The wholesale destruction of the first IJzertoren in 1946 served to confirm perceptions of unjust persecution from the Belgian state. As a result, the chapel on the ground floor of the second IJzertoren (rebuilt in 1965) returns the visitor to a resurrected Flemish nationalism that was heightened during the Great War. Two disparate sets of stained glass windows dominate the space. 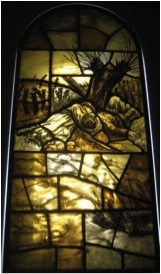 The first set of windows emulates the Stations of the Cross, but the figure of Christ, typically represented moving toward his destiny as the first martyr, is replaced by the WWI soldier crawling in the mud of the front, guided by the AVV-VVK, towards his own submission to the Flemish Movement (Picture 2). The soldier/martyr is reminded of his suffering (Picture 3) and his cause (Picture 4). The windows are executed in the colours of the war front, as shades of brown and a dull golden light echo the ubiquitous mud of the trenches. The dull, drab colours of the “martyr” windows are in direct contrast to a second set of windows, which are composed in the bright colours of traditional medieval stained glass. This second set of windows begins with an image of two “martyred” Flemish Earls who died resisting the 16th century Spanish occupation. 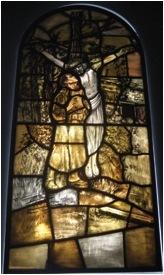 The second window in the series (Picture 5) presents the WWI soldier as a medieval warrior. With the Lion of Flanders emblazoned on the flag behind him, the image conflates the medieval and romantic aspirations of a sovereign Flanders with the experience of the Flemish soldiers in the First World War. A more cultured and educated Flanders rises as revealed by a small figure in the lower right reading Flemish (not French) texts. This image may also refer to the construction of the WWI trenches (note the sandbags) and the reading of 19th century Flemish literature by the members of the Front Movement, a covert political movement organised in 1915 by a group of Flemish soldiers and dedicated to the recognition of Flemish culture and the primacy of the Flemish language. A second example depicts the triumphant reconstruction/resurrection of the IJzertoren after its destruction in WWII (Picture 6). With the IJzer cross behind him, a Flemish soldier holds aloft a medieval shield with the Lion of Flanders, a symbol of the Flemish Movement. Small crosses and rubble from the first IJzertoren suggest the deaths that make his triumph possible. A woman holds her baby up as an offering toward the Flemish ideal. A third window (not pictured) suggests the solace and vindication the Flemish soldier finds in the figure of the Virgin as she holds a Flemish tombstone adjacent to the scales of justice, serving to underscore the inequality felt by the Flemish soldiers at the hands of the French-speaking officer. The stained glass windows in the IJzertoren Memorial continue to underscore the tower’s medieval foundations in the struggle for a Flemish consciousness. King Albert, in an attempt to boost army enlistments and national moral, appealed directly to the patriotic pride of the men of Flanders and explicitly recalled the 14th century Battle of the Golden Spurs (1302), a definitive landmark in the development of Flemish political independence. 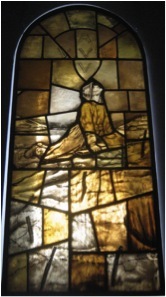 As verified by the stained glass in the IJzertoren, an emphasis on the Lion of Flanders, the symbol for Robrecht van Bethune, the heroic leader of this battle, continued in the post-war years, and has continued to shape Flemish political rhetoric today. Albert promised Flanders ‘equality in right and fact’… after the war. As the promise was not kept, the glass serves as a reminder of the Flemish struggle linking the injustices of the past to the goals in the present. 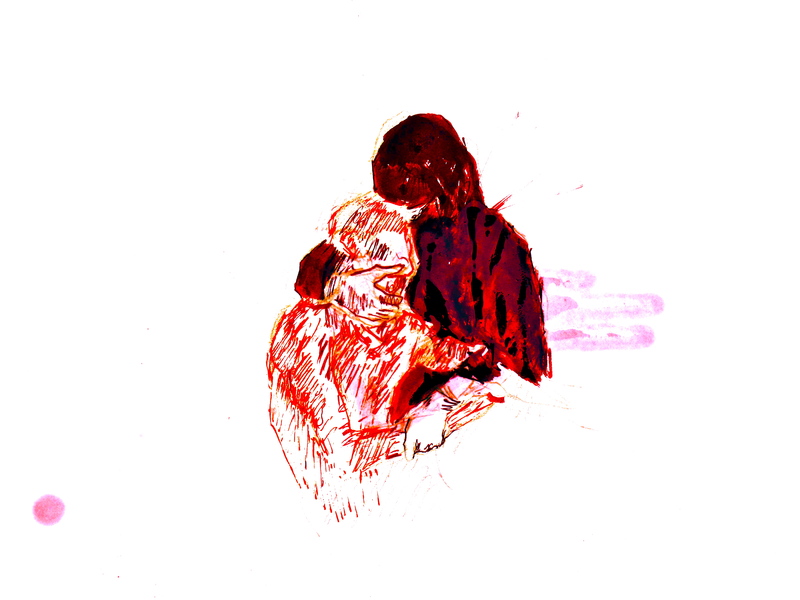 Karen Shelby is an Assistant Professor of Art History for the Department of Fine and Performing Arts, Baruch College, The City University of New York. All pictures taken by J. Pingree, 2007. Graaf van Egmont and Philip de Montmorency, Count of Hoorne. Textiles are an influential site where gender ideals and national, local and ethnic identities are produced and expressed. However, with the advent of tourism and consumerism of fourth world products in Laos, the tensions between quantity and quality, local markets and global markets and meaning and meaninglessness have become magnified. This photo essay will examine some of these tensions and demonstrate how the authenticity of only a few textiles and designs has been preserved. Cohen (2000) writes that with commercialism and tourism many crafts fade away, while at the same time others are promoted – just in a simplified form. And though this may have been the case in 2000, in 2011 the vast majority of contemporary Hmong products are commercial items devoid of any profound cultural meaning. Tourist objects still contain old, remnant motifs, but they are made for tourist consumers oblivious of the Hmong, their cosmology and their traumatic history. Moreover, some textiles in the market are made in China. 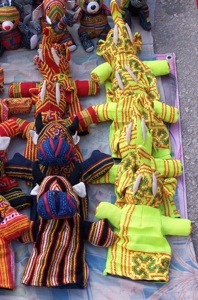 Hmong textiles have become mere commodities, sold to non-Hmong as toys or wall decorations. Textiles are sewn together quickly for mass consumption. Contemporary cloth only represents cash to its producers and a portable experience to the consumer. Designs are created based on economic demand. Thus, the textiles are increasingly atemporal and aspatial. The once symbolically saturated textiles become hollow objects, filled only with vague remembrances of decontextualised holiday memories from nondescript regions in Laos, Thailand or Vietnam. As the Hmong’s world shrinks, most of what is produced becomes part of the global throw-away society. Picture 1. Quilts on the right are reportedly made in Chinese factories. 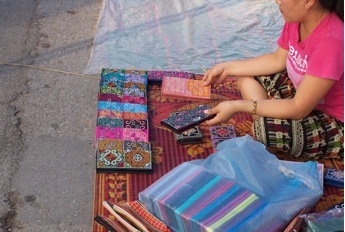 In Luang Prabang’s night market, very few traditional designs are found in their original form. Most of the objects in the night market are for tourist consumption, and a vendor I came to know well informed me that many of the more complicated quilts and handbags are actually mass produced in Miao towns in China (see picture 1). 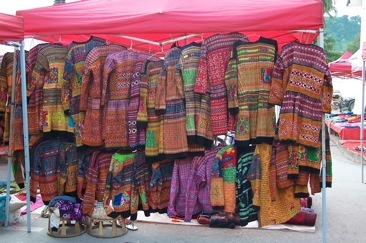 While much of the Hmong textiles are still locally produced – the Hmong of Luang Prabang make slippers, dolls, tablecloths, hand and tote bags, wallets and change purses, shirts, slippers, dresses, hats and skirts (see picture 2 to 4) – few kiosks sell the ‘refugee style’ cloths in the night market. Picture 2. Shirts produced for tourist consumption. These textiles retain conventional motifs. However, the motifs are no longer ‘saturated’ with meaning. Picture 4. Embroidered wallets for tourist consumption. In contrast, textiles created for Hmong consumption are painstakingly sewn and take years to produce. They still symbolise their ancestors, the bonds between families or pan-ethnic unity. What they produce for themselves is guarded, becoming more significant and concentrated sites of meaning. These pieces are cherished, used only on occasion, and represent deep and salient morals and values (see pictures 5 and 6). The Hmong textiles express their identity, display wealth and are a medium for the journey into the afterlife (Craig 2010). 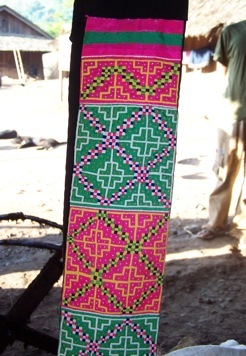 The textiles also represent the Hmong cosmos and protection (Livo and Cha 1991; Fadiman 1997; Cohen 2000). Picture 5. Appliqué/ embroidered belts worn during wedding and New Year celebrations. Picture 6. Man’s funeral belt with squared squares linked together. This is a relatively new motif. In the past the squares were never linked together. Reportedly, this represents that all Hmong are one people. The traditional cloth is worn by young and old women during special occasions such as the Lunar New Year or wedding ceremonies (see picture 7). 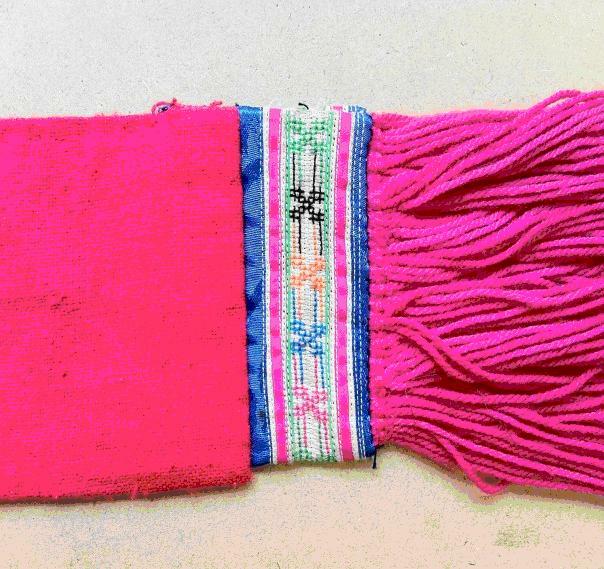 Yet much of the Hmong textiles’ sacred use and the meaning attached to those rituals have disappeared or have been relegated to intimate private affairs. 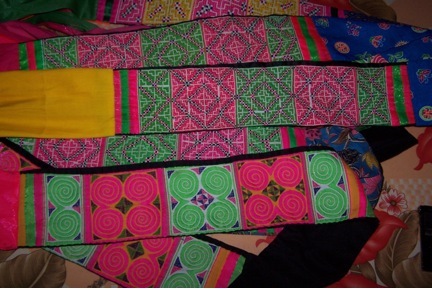 One might predict that Hmong textiles and the associated meanings will be lost as has been the case for much folk art with the introduction of mass produced utilitarian goods and other global trends such as tourism. The Hmong have made a dichotomy of what they produce for themselves and what they produce for ‘others’. In addition, they still value a woman’s ability to sew. This suggests that even though the Hmong might not overtly expressed their identity through dress as they did in the past, ethnic identity is expressed and maintained in the textiles they produce for themselves. This may be because the Hmong see themselves as members of different communities: as white or blue Hmong, as Laotians, or as part of a global pan-ethnic Hmong community. Thus, an examination of how, where and what textiles they make tells us about their identity. Their textiles reflect how they see themselves and how they believe others see them, too. Picture 7. The bridesmaid, bride and groom (from left to right) wear a mixture of contemporary clothes and belts. The colours are in red and green. The sailor’s tags and straps with hanging silver coins follow convention and contain traditional motifs. The groom’s vest follows similar conventions. Note, however, that the bridesmaid is wearing a Chinese Hmong hat while the bride wears the more conventional headdress. Dr. Simeon S. Magliveras is a Post-Doctoral Research Fellow for the School of Art, Media and Design at the Nanyang Technical University, Singapore. All photos courtesy of Dr. Magliveras. Cohen, E. (2000). 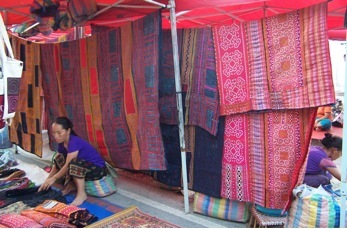 The Commercialized Crafts of Thailand: Hill Tribes and Lowland Villages. Honolulu: University of Hawai’i Press. Craig, G. (2010). “Patterns of Change: Transitions in Hmong Textile Language.” Hmong Studies Journal 11: 1-48. Fadiman, A. (1997). The Spirit Catches You and You Fall Down: A Hmong Child, Her American Doctors, and the Collision of Two Cultures. New York: Farrar, Staus and Giroux. Livo, N. J. and D. Cha (1991). 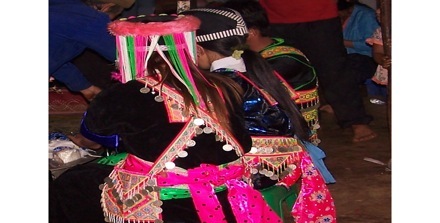 Folk Stories of the Hmong: Peoples of Laos, Thailand and Vietnam. Englewood, Colorado: Libraries Unlimited. Peterson, S. (1988). “Translating Experience and the Reading of a Story Cloth.” The Journal of American Folklore 101: 6-22. This work takes seriously the fact of different nationalisms in Yemen by relating three views of the same event to a potent symbol of Yemen’s collective identity – its flag. The work does not demand an assessment of the truth of an event in Yemen, nor does it require that the event be judged equally in import by all. It requires only that the viewer accepts that different, plural, views of events, facts and narratives are legitimate, in Yemen as elsewhere. This work is part of a body of work on drawn and painted views on politics and conflict. That body of work is available at the following blog address: blackandwhiteandthings.wordpress.com .